Ready for personal volume control without headphones? Looking for wireless TV speakers? The AudioFox is your solution for the tv volume problem. Volume and mute buttons mounted right on the speaker. 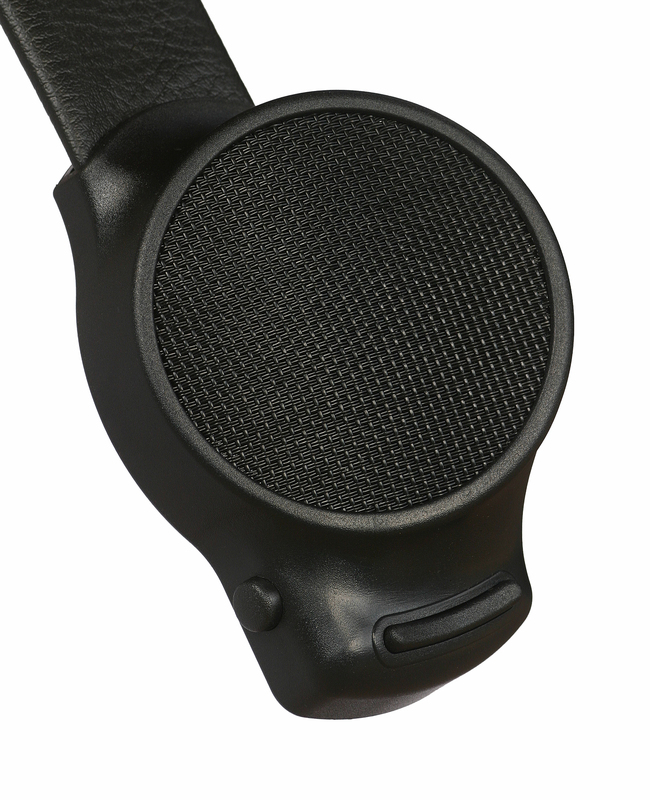 Steel straps wrapped in vinyl grip the back of your chair, delivering the digital sound right to your ears. It is the only product that gets the sound this close to the user without requiring headphones. This system comes with everything you need to use your AudioFox with virtually all televisions. Good for hearing impaired, but.. These speakers are good for the hearing impaired, but the fidelity is less than I had hoped for. We love it. We can not get it hooked up to our surround sound because our receiver does not have audio out , so we are going through the direct TV box. Thankx a million for the great repair job. speakers working perfectly, and the new hangers are really nice. Great service as always. I am really pleased with these speakers. I am very hearing and sight impaired. The speakers work wonderfully. We no longer need to have the TV blasting for me to hear. My wife can mute the TV when she talks to me or when she is talking on the phone and I can still hear the TV. The mute button for the speakers is right at my finger tips when I need to hear people talking to me. I could not be more pleased with crisp sounds produced by these little speakers. I only wish I had these a long time ago when I started losing my hearing. I would highly recommend these speakers to any one who has hearing disabilities. Just be aware you will be amazed as well! Mom's TV was bothering her neighbors. I set up the speakers is less than 15 minutes. Now Mom can hear from her easy chair and the neighbors no longer hear the TV through the walls. I liked how easily the setup was. One has to know what how the TV audio needs to be set. The cover on the speakers needs improvement. I moved my hand across the screen and the cover pulled off the speaker. I wanted to buy something for my husband who was having a hard time hearing certain tones when watching TV, however i didnt like the isolation of headphones or earbuds. These speakers have been wonderful! The only reason for 4 instead of 5 is that the button on the side seems cheap possibly easily broken. So far though they are GREAT! I would recommend highly. the best for my ears. I give them a triple AAA. This is the best thing for people who are hearing impaired. It allows them to hear the TV without blasting the others out of the room. great ! Peace in the house. Bought for my dad who lives with us, he is hard of hearing and will not get hearing aides, My wife has exceptional hearing, she would get upset because he has the TV cranked in the family room and she needs ear plugs to find any peace any where in the house.